It’s only fitting that the first Shangri-La in Europe would be housed in a Parisian palace that’s over 120 years old. Today, the hotel impresses visitors with its grand and eclectic styles from the 19th and early 20th centuries. 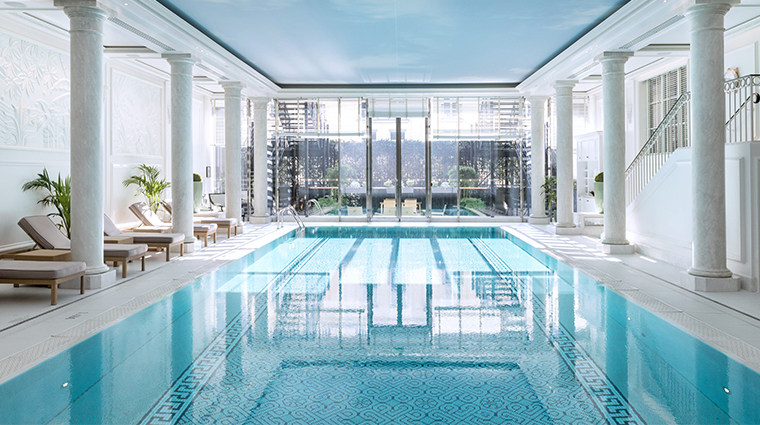 Throughout the four-year renovation that completed in 2011, Shangri-La Hotel, Paris took great care in preserving the past, even getting the former palace registered as a Historical Monument in 2009. If falling asleep to the Eiffel Tower’s nightly light show sounds like a dream, then the Shangri-La is your hotel, since a host of rooms and suites feature views of the city’s iconic landmark. Almost half of the hotel’s rooms have private balconies with views of the gardens and, of course, the Eiffel Tower. Art and history lovers will find the hotel to be a perfect base for exploring the region’s many museums. Within walking distance are the National Museum of Modern Art, Palais de Tokyo, Marmottan Monet Museum, Palais Galliera and Guimet Museum, which holds the city’s largest permanent collection of Asian art and exhibits. In the summer, you'll be hard-pressed to find a better alfresco bar than the one at Shangri-La Hotel, Paris. Get a front-row look at the glittering Eiffel Tower with a glass of champagne at this must-visit bar. There are four excellent dining options on the property including a Chinese restaurant that serves dim sum for lunch and a fine-dining French eatery that offers luxe specialties like duck foie gras terrine and roasted pigeon breast. The opulent decor fits this regal hotel. Originally built in 1896 and known as Palais d’Iéna, Shangri-La Hotel, Paris was once the private residence of Napoleon Bonaparte’s grandnephew, Prince Roland Bonaparte. Located in the 16th arrondissement, in a chic residential neighborhood, Shangri-La Hotel, Paris is just across the Seine and sits in the Eiffel Tower’s shadow. Extensive research was conducted in order to keep with the historical interior design of Palais d’Iéna. These touches are seen in the silk wallpaper, crystal accents, carpets and custom-made furniture. Large by Parisian standards, the standard unit is between 376 and 602 square feet, with the spacious suites — two of the suites measure nearly 3,000 square feet — having separate bedrooms and living rooms. With the exception of the three signature suites, all the rooms are decorated in a French-meets-Asian style, using blues, whites and creams. In both the rooms and suites, marble bathrooms feature double sinks, a separate bath and shower, heated floors and televisions integrated into the mirror. Shangri-La’s worldwide signature fragrance is found in the white tea toiletries by Bulgari throughout the Paris hotel. Reminiscent of the original Shang Palace in Hong Kong’s Kowloon Shangri-La, Paris’ version of the Chinese restaurant is arguably as highly regarded. Chef Samuel Lee and his team of masters create authentic and creative Cantonese dishes, including a lunch-only dim sum. The bee, an imperial symbol of the Bonaparte family, lends its name to Shangri-La’s gourmet French restaurant, L’Abeille. The restaurant is an elegant and intimate setting overlooking the hotel’s garden. Open for dinner only Tuesday through Saturday, L’Abeille allows you to choose an à la carte or tasting menu. In the center of the luxury hotel, under a beautiful glass cupola, is La Bauhinia. Named for the orchid that appears on the Hong Kong flag, La Bauhinia is open for breakfast, lunch, afternoon tea, dinner and weekend brunch, serving French and Southeast Asian specialties. Cozy lounges located near the entrance of the hotel are the places for a light bite, cocktail or coffee. The mahogany- and bronze-draped Le Bar specializes in cocktails with Asian-influenced ingredients including soy sauce, ginger and horseradish.